Welcome to Week 7 of the CAL! Where has the time gone?! Can you believe we have been at this for a month and a half? 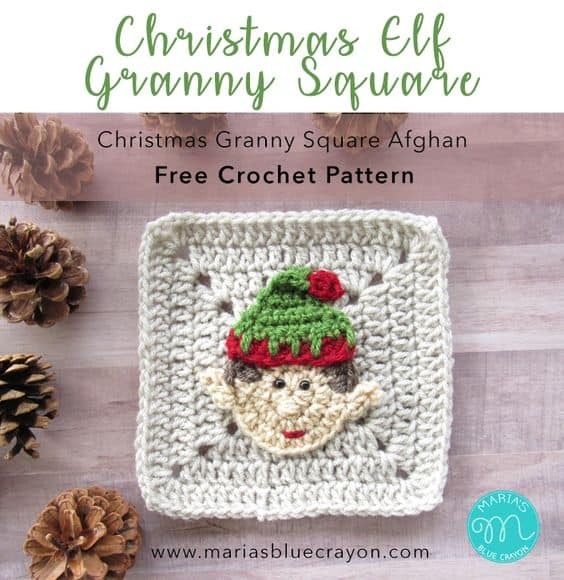 This week we will be working up 8 granny squares and the Elf Applique. If you would like to purchase the complete pattern, you may do so here on Ravelry. You can also save it on Ravelry for later. Turn circle so the brown bobbles are on top, representing the hair of the elf. Chain 1, [3SC, triple crochet] all in one space, fasten off. Attach yarn one space underneath bobble on other side of head to create the left ear. Attach safety eyes or create a french knot with black yarn and a tapestry needle. Sew on nose with tapestry needle and beige yarn. Using a running stitch, keep overlapping the same stitch 8-10 times to create a bump. You may need to disable your ad-blocker if you are unable to access the video below.